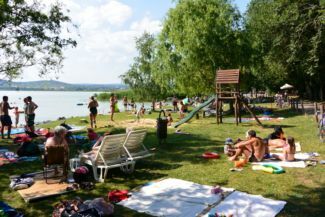 The village lies on one of the most scenic parts of Hungary, the Tihany Peninsula. 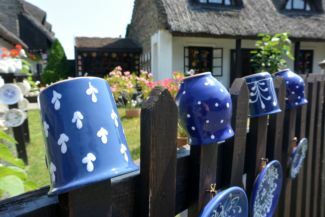 The Hermit Houses can be reached from the port or the abbey with following sign Z but it is also on the Lajos Lóczy nature trail. 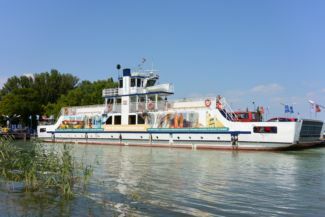 The Lajos Lóczy nature trail, starting from the ship station, leads through the whole peninsula. 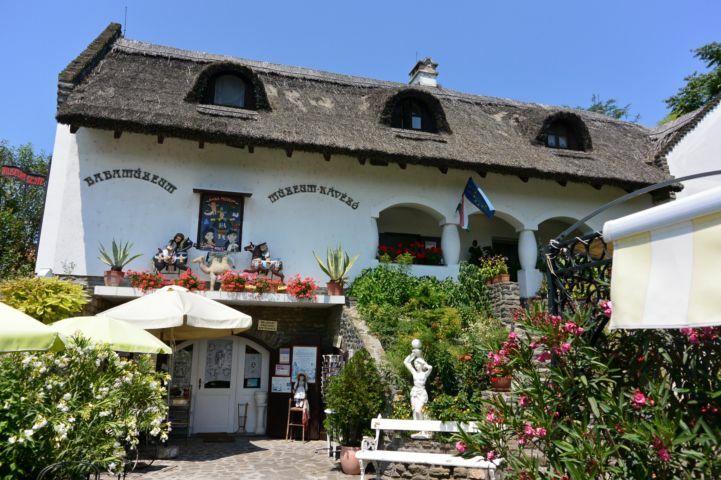 During the trip the traveller can get to know the interesting geological formations of the area (Weathered Rocks, Golden House), the geohistory of Tihany reveals itself. The trail can also be reached from the ship port with trail Z going south. 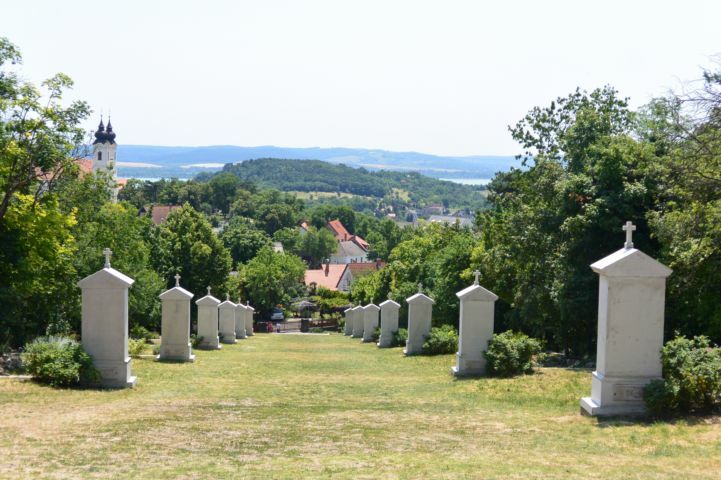 This trail goes past Akasztó-domb (Gallows hill) which got its name from the 15th century: in 1417, the Tihany Abbey, after receiving the right to blood court (death penalty), set up the gallows pole here. Benedictine Abbey Amongst the many sights of the peninsula the Benedictine Abbey church and monastery are the most famous. Former wine cellar and press-house of the Abbey Located north of the Inner Lake, the wine cellar and press house was built in the first half of the 19th century and it can store over 4000 hectoliters of wine. The Classicist style building has a Latin Cross plan. Charles IV Calvary The calvary with 14 stations and 3 crosses was originally built in the 1920's and it was dedicated to Charles IV who spent a short period in captivity in Tihany. The calvary was demolished in the middle of the century but rebuilt between 2007 and 2013. Open-air Museum of Ethnography (Skanzen) The Skanzen covers two buildings which were built in an architectural style unique to Tihany. One display the everyday items of a fishermen's guild, in the other we can learn about the lifestyle of peasants. 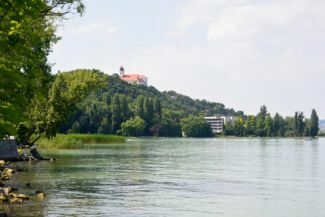 Inner lake Though the Inner Lake of Tihany is mostly enjoyed by anglers, it is an ideal site for taking a stroll and seeing the nice panorama and enjoying the quiet atmosphere. Near the lake we can even see Hungarian Grey cattle. 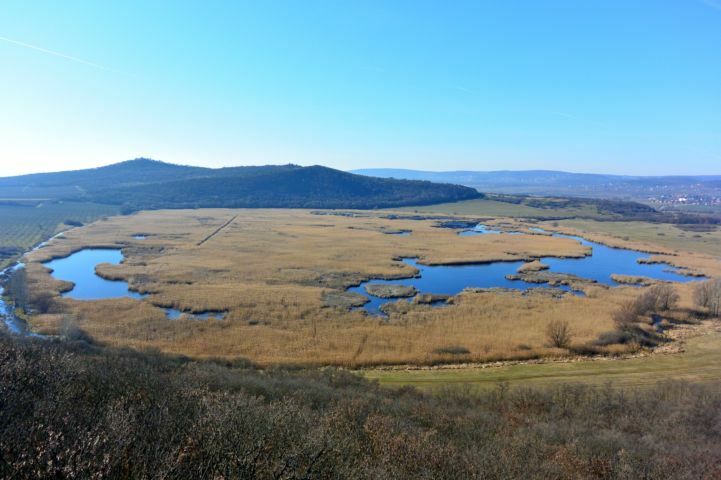 Óvár hill From the 214 high hill, there is a nice panorama of Tihany, the Inner and Outer Lakes and, of course, the Balaton. If we reach the top of the hill, we can see the remains of a fort hill built thousands of years ago, and also the cells of medieval friars carved into the soft basalt tuff. Friar habitations Found in the soft basalt tuff of the Óvár Hill, the cells and chapels were carved by friars in the 11th century and were probably used until the 14th century. Today only three of the cells are preserved of these historical remains unique in Central Europe. Apáti Church The church built at the northern entrance of the Tihany Peninsula in the 12th-13th century was destroyed during the Ottoman times and only the ruins remained for centuries. In the 20th century the church protected from decay and in 1999 it was rebuilt to its former glory and is being used today. Church ruins at Újlak During the 12-13th centuries, the small ferry village, Újlak was located at the southern end of the Tihany peninsula. Today its only memento are the ruins of church. The church was facing north which was rare in this era and region. The ruins are also worth visiting for the spectacular panorama. Reformed Church and Bell Tower The Baroque church was built in 1793 and we can get the best view of the building from the columned bell tower. The protected monuments (the church, the parish and the bell tower) were fully renovated between 1996 and 2000. Lavender House Visitor Centre In the visitor centre we can learn about the history of the peninsula through short filmes and interactive games. There are also handicraft workshops where we can make a pincushion filled with lavender among other things. 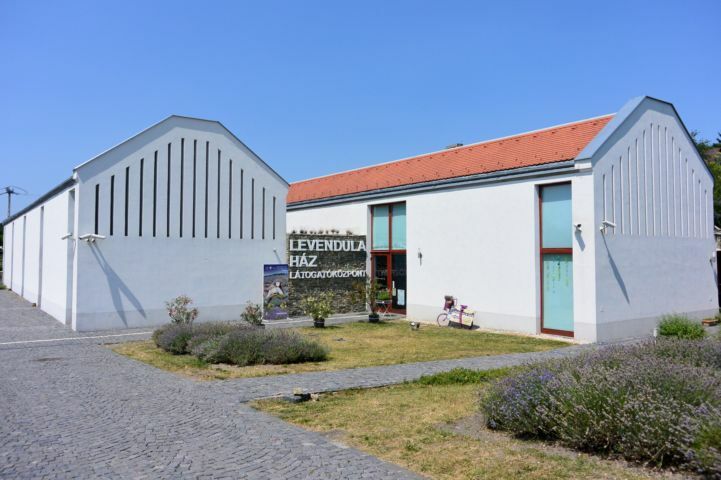 The Lavender House also offers guided tours. Old Lavender Fields Next to Csúcs Hill we can discover the purple gem of Tihany every summer as this is the season when the plants of the lavender field blossom. The flower with a strong fragrance has been planted in Tihany since the 1920's and today there are more than 30 hectares of lavender fields. 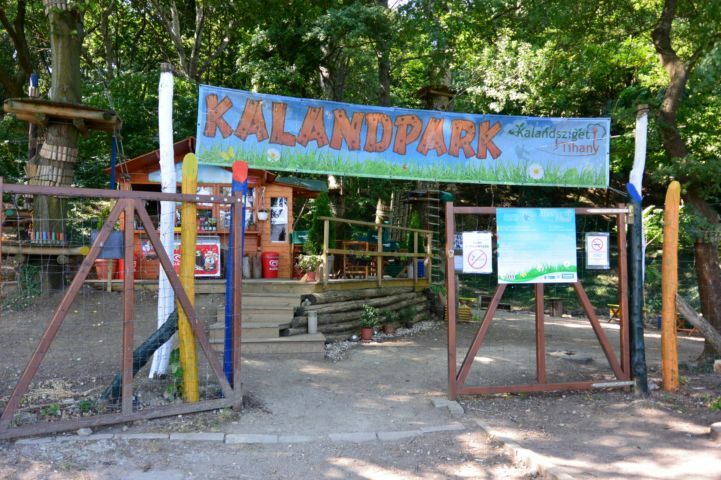 Lóczy Lajos Nature Trail The 11 km long study trail named after geologist Lajos Lóczy can be completed in 6 hours and offers a lot to learn about the natural sights of the Tihany Peninsula. The path marked with a red cross leads through the protected area of the Balaton-felvidéki National Park. 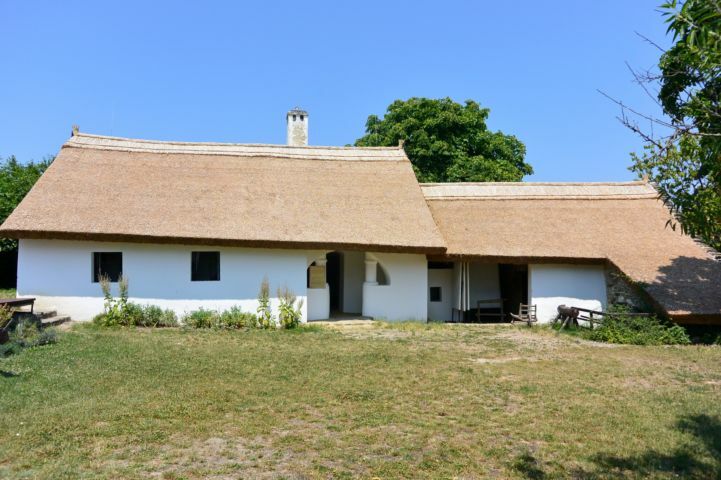 KOGART Museum The second KOGART museum in Hungary was opened in Tihany in 2013. 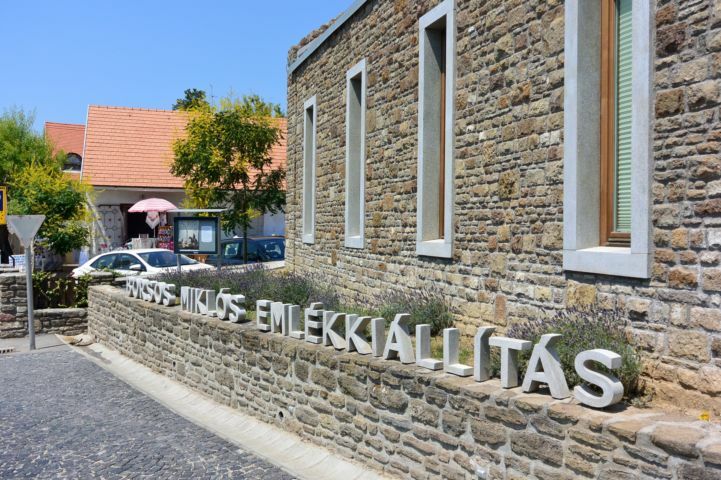 Open all year round, the museum's permanent exhibition showcases the works of Miklós Borsos. Doll Museum The museum showcases a collection of almost 500 porcelain dolls. The dolls are arranged in different scenes which are very telling of the lifestyles of different periods. 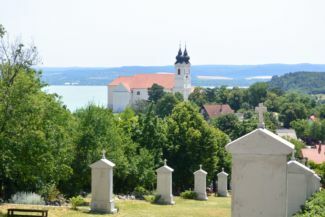 The Tihany Peninsula together with the Benedictine Abbey is one of the most beautiful parts of Balaton. 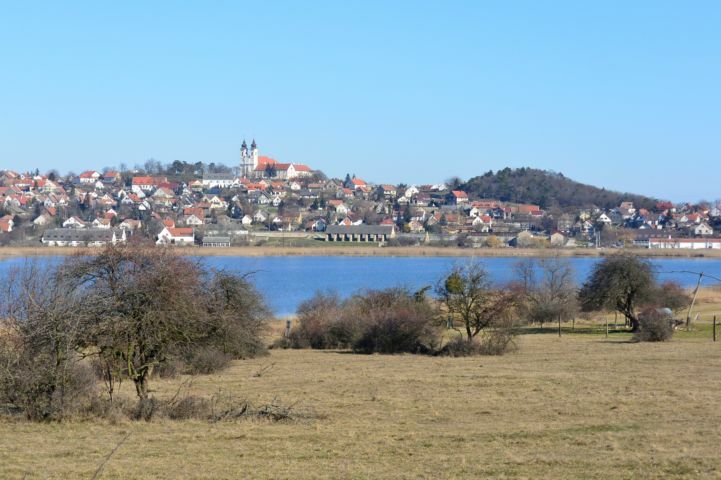 Today, Tihany means the peninsula which is an administrative unit but in the Middle Ages multiple villages occupied the land. At the Northern part of the peninsula was Apáti which was destroyed by the Ottomans. Its church was built in the 12th century which was rebuilt from its ruins in the recent years. Though not a ruin anymore it is still referred to as such. Újlak village, which was near the port, has also only a church ruin as a reminder of its past existence. In Óvár a hill fort was built in the Bronze Age, its trenches still visible. Important findings were unearthed here: burial urns, fragments of pots. The establishing charter of the monastery contains the oldest written words of the Hungarian language, the original is kept in the Pannonhalma Abbey. The church was almost completely destroyed by the Ottomans with only the Romanesque style crypt intact. The founder of the abbey, King Andrew I, who died in 1061, is buried here. The current richly decorated Baroque church was built between 1719-54. The monastery was also rebuilt and expanded in these times, getting its present rectangular form. The work on the inside of the church was started in 1753 by Sebestény Stuhlhoff who made the spectacular wood carvings. He worked here until his death, he is buried in the crypt under the church. The church was sanctified by the Bishop of Veszprém in September 1778. Unfortunately, a century later a side of the church – the one not built on the rock – partly collapsed, a more serious restoration was needed. The inside of the abbey was renovated as well, decorated by the murals of Károly Lotz, Bertalan Székely, Lajos Ébner-Deák. 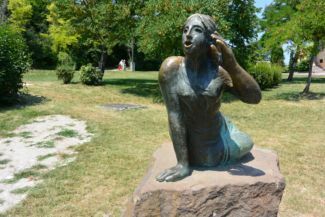 The abbey was famous for the Tihany echo, its northern walls could „repeat” up to 10 syllables. Unfortunately, the new buildings in its vicinity destroyed this phenomenon. After Mongol invasion, a stone castle was built on the Csúcs Mountain which was important in the border castle system used against the Ottomans. In the beginning of the 18th century, similarly to other castles, it was blown up by the emperor.